Everyone has their own way of dealing with cancer. 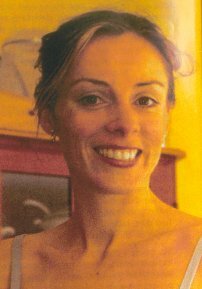 Faced with a diagnosis of malignant melanoma, Orla Mclaughlin rejected conventional treatment and embarked on a strict nutritional programme. She agrees her decision may be wrong for many people but feels it was the way forward for her. In her fight for recovery, Orla has learnt to overcome the feelings of resentment and negativity that many cancer sufferers will identify with. Orla Mclaughlin turns her back, pinches her nose, and chokes down the fermented soybean concentrate she takes to boost her energies and immunity to help her in her fight against malignant melanoma. There is some persuasive evidence for this noisome concoction, Haelan 951. and we laughingly agree that anything that tastes and smells so foul just has to do some good. Orla is midway through a two-week juice fast. Today she will juice two big bags of organic apples and three of carrots. She will have juice every hour, laced with flax oil. In a normal week, she eats a wholefood diet, with six small glasses of juice a day - organic lettuces, celery, carrots, apples, spinach all go through the whizzer. She has three coffee enemas daily, and has learned to enjoy them; they’re here reading time. She is not cured of cancer, but, at 32, she’s living with it. She has come a long way since she was diagnosed in May 2000. she has made some tough decisions in the matter of treatment, but does not proselytise. She follows her diet - but still hungers for try-ups. She does not claim enlightenment, she hasn’t found God - but, crucially, she has found herself. Her problem began almost 12 years ago, with a friction burn. "I was a dancer," she says, "I danced barefoot a lot, and I burnt the top of my foot during rehearsal". About five years later, the scar tissue raised. Three times over the next three years, Orla went to her GP. Three times he told her it was a wart. It was not until she moved home and changed her doctor, that anyone voiced concern, "She saw my foot and said, I think we should biopsy"
The biopsy confirmed the doctor’s fear: it was melanoma. And, in July 2000, when Orla was in hospital recovering from an operation to remove the lesion and to take a graft from her thigh, the consultant brought more bad news: a lymph node from her groin had tested positive for cancer. Two treatments were urged upon her, a double whammy of ’block dissection’ and ’isolated limb perfusion’. The first would entail the removal of the lymphatic glands from the groin. The second is a procedure whereby the blood supply to a limb is isolated and infused with a very high concentration of a chemotherapeutic agent, before being re-circulated, "The blood is drained from the leg, put through a dose of chemotherapy so high that your organs couldn’t take it, then put back in" Orla explains. "My gut reaction was, No, I don’t want that. But I thought it was just a natural tear of being interfered with, and not necessarily a responsible decision. I sat on it for a couple of weeks, before going back to the consultant and saying, I’m not sure that I’m ready to go ahead. He listened patiently, then said, Well, lets make the date, anyway." As the day for treatment drew nearer, Orla’s resistance grew. The more she read about limb perfusion, the more she set her face against it. "My decision wasn’t based on the knowledge that there was an alternative path, but on the fact that I didn’t want this traumatic experience, and on the thought, I’ll take my chances. I’ll die when I’m going to die, at my own speed and in my own way". On the day before I was due for surgery, I said, I don’t want this. I felt horrendously guilty, because they had flown a guy in from Edinburgh and I didn’t want to let anybody down. But my consultant let me off the hook. He said, "Don’t worry, we’ll give it to somebody else." Orla’s decision might have been wrong for some people, but she is clear that it was right for her, and it was made in the full understanding that her prognosis without treatment was poor. "They never really told me what to expect. There was one very feisty oncologist who said, We’re going to zap you with so much chemo, you won’t be able to walk. I thought, Oh, my God, you’re terrifying! You must be on my side." Although she was frightening, she was at least potent. But even she wasn’t prepared to give me a prognosis, beyond, "Well, in five years’ time I think you’ll be in trouble." Now into the fifth of those years, if Orla is physically under par, she is psychologically robust, and has come a long way down a very rocky road. Having turned down radical treatment, she faced the stark reality that she was on her own "I sat down at the computer, feeling quite empowered. I started to do searches, with no ability to vet what came up. I was reading incredible stories - have melanoma, and, oh, my toe fell off yesterday.’ ’Mark died this time last year Our prayers are with him!’ At this point, feeling freaked, she enlisted friends to do research. "They were fantastic, They came up with a lot of information, and I was so pleased that they knew all about it, that I didn’t feel I had to." She threw herself into her dance, but, "With the diagnosis came incredible fatigue- ’I literally couldn’t leap. It was as if somebody had put a bag on me, and I was living In the dark. It wasn’t real tiredness; it was my brain that was tired. I just wanted to sleep, because it was easier than thinking." Orla did, though, make one clear decision - to embrace nutrition. That seemed like the least challenging strategy. "I was still in avoidance. The thing that was very pro-active was the no to treatment. It was a recognition that my personality and that way of proceeding didn’t mix. So I was happy about it, but I did want something else to take its place. Because then the fear was there, and I didn’t want to have to deal with it." There was, too, a sense of deprivation. "I had had a fairly social life, and what I read negated everything loved. All the excesses of food and drink and smoking weren’t there, and I was resentful. What I thought it was saying was that I couldn’t have a personality." "I was actually eating very well, and I stopped drinking, unless it was a special occasion (of course, ’special’ can be whatever you want it to be). I did stop smoking, that was wonderfully easy, but it took me a long time to sort myself out. It’s easier now because I accepted that I couldn’t make all the decisions. I didn’t want the NHS, but I did want somebody holding my hand. I wanted to feel that I was responsible for my health, while, in truth, being looked after." In the course of friends’ researches, the name of Etienne Callebout (ICON’S icon for March 2004) kept turning up. A Belgian-born physician, Dr Callebout is trained in conventional medicine, acupuncture, homeopathy and naturopathy. "My GP said he had a good reputation. We had spoken about how I felt, why I hadn’t had treatment, and why I was shopping around for somebody to partner me in dealing with my health, and she felt he was an appropriate person. At the first appointment, I sat there like a crowned princess, saying, in essence, "I’ve walked away from the medical establishment. See how strong I am?" And he said, "You don’t have to worry about anything from now on. I thought, Oh, thank you! You’ve got me to a T!" Dr Callebout’s optimum regime entails a nutritional and detoxification programme, lifestyle modifications, psychological healing strategies, and a seemingly endless list of supplements, taken according to alternating or rotating protocols, to allow the cancer process no chance to adapt. "I started on a full programme of tablets, liquid supplements and powders, and a very specific food-combining diet that involved measuring everything," continues Orla. "What I was taking on was the hardest job I’d ever had. It was an alternative career, and I wasn’t ready for that, didn’t want to have to work at it. Because then, of course, I’d have to acknowledge it. I think I lasted two months on the diet." Meanwhile, she attended a two-day course at Bristol Cancer Help Centre. "I didn’t find it very good, mainly because there was one person on the course who was incredibly negative. It did, though, help me to look at the regime through different spectacles, and I realised I didn’t need to whip myself every time I missed a juice. I looked at what I could physically manage, and what I really hated. I wrote lists and crossed off footbaths hot and cold packs, and cold showers. Ugh!l don’t do cold showers." Bigger even than the question of compliance, though, was that of expense. To take every supplement Dr Callebout recommended involves prohibitive costs "So I asked him to devise a programme that was more affordable." The new, pared-down regime felt precarious. I fretted that, "Oh, no, I’m going to die anyway, because I can’t afford ginseng." I drove myself potty. So I went back to Bristol for a week, and it was wonderful. They get you to list the things you would like from the week, and my expectations seemed so high, but I wrote it all down." "When I came back, I was able to look at my emotions. It had taken me that long to acknowledge that this was an emotional question. I had known things were wrong, because I always used to read a lot, and in those first two years from diagnosis, I couldn’t pick up a book, especially if it had emotional content. Whereas now I’m addicted to Six Feet Under, because it’s harrowing from beginning to end." At Bristol, too, for the first time, Orla saw a counsellor. The hospital had offered palliative care, "But I was mind-boggled by the suggestion. It takes you to something you don’t want to hear. So, of course, I’ve never been anywhere near it. Counselling teaches you how to look at death, and to deal with your fear, having understood that you don’t know what’s going to happen between here and there. Then you can look at how you want to live your life." "All the time I’d been reliant on the support of friends, I had felt as much responsible for supporting them. They’d done all this work, and I didn’t feel it would be fair of me to break down. At Bristol I was free to let go. That felt like a great opportunity, yet I didn’t take it until I walked into the room and the counsellor smiled at me. That was it. I was a mess on the floor, it was an absolute shock to me that I was so distressed. I really had had no idea." "Well, it all came up, and, of course, it was enormous. So, I pushed it straight down again. But once I had acknowledged that it hurt I could start to deal with it. I haven’t achieved anything other than the recognition that I have a lot on my plate, but that in itself has been great." Orla’s current regime is, she says, "sufficiently difficult for me to feel I’m working hard enough. It’s affordable, and it’s do-able, but it’s still considerable. If it were too little, I’d have no faith in it, and I’d try to sabotage it." "I always had a faith in nutrition. What I don’t find easy to have faith in is a spiritual sense of self, of wellness. I’ve never been of any religion, but I’d never felt quite so spiritually dead as I did after diagnosis. I haven’t found a great sense of oneness with the world. I haven’t become somebody I wasn’t. I might have become a little bit more the person I was before I got grown-up and jaded. I’m more like I was at 18.1 feel very me. I feel that I am in my space in the world, and it’s ok."
"I have forgiven myself for having this diagnosis, and for not always coping. It’s about recognising and accepting your limitations. The ritual a regime like this is quietly meditative. You’re doing the same thing at the same time every day. that’s restful." "I eat specific vegetables - asparagus, broccoli, onion, cauliflower... Lots of seaweed. Plenty of grain. I always ate everything you shouldn’t - bacon butties, white bread, all that stuff and loved it, but it doesn’t take long for your palate to adjust." As for booze, she jokes, "I reached a compromise, which was, I’m really not going to drink. OK, I am going to drink, but only champagne. So every now and then I go out and get legless. Because I’m so detoxed, it only takes one glass to get me drunk. I’m the cheapest date in town." Orla Mclaughlin now seems not just centred, but, at moments, lit from within by joie de vivre. "I feel fine", she says. "I look fine. I haven’t got rid of this disease, but I control its rate of growth." It’s nearly time for a juice. She shows me to the door, stoops to pick up a flier from the mat, from the local curry house, and sighs just a little for the things she once enjoyed - in a different lifetime.